It takes a village to restore a village. Nine months after the April 25, 2015 earthquake destroyed 600,000 buildings throughout Nepal, the people of Sanogoan are working together to rebuild their homes and their lives. The town still looks like a tented camp—white tents in neat rows, with solar lights hanging from the roofs. Women talk and laugh as they make bricks together. These bricks will not necessarily be for their own immediate benefit, but will help the most vulnerable, who were first selected by the community to construct their new homes. The most exciting thing is that these women are not just reconstructing their homes, but also improving their lives and livelihoods. 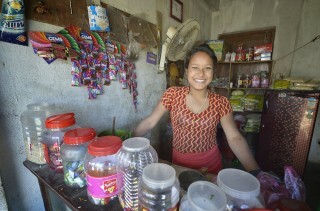 The small business development program that PWS&D is supporting through the ACT Alliance and Lutheran World Federation is doing even more to promote women’s empowerment. Sixteen people were selected by the community to develop a small business with the support of 15,000 Nepali rupees (about $185 CDN). Saru Shrestha was one of those selected. Nineteen years old and from a family of 10, Saru had to leave school after the earthquake to help care for her younger siblings. With the seed money, Saru established a small shop selling tea, snacks and sweets. “At first it was hard, especially arguing with people who buy things on credit. But I feel less shy now,” she shares. Saru uses most of her income to pay school fees for her siblings. Some of it she saves for the future though. “My dream is to open a second shop, selling cosmetics,” says the young entrepreneur. *Adapted from a story by Lucia de Vries, LWF correspondent.